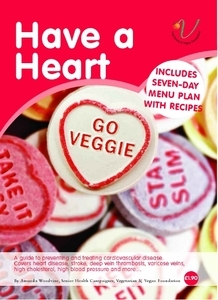 Have a Heart – Go Veggie! Cardiovascular disease (CVD) such as heart disease and stroke is the UK’s number one killer. More people are living with this disease than ever before and numbers are steadily rising. We investigate the cause of CVD and explain why a plant-based diet can be used to both prevent and treat the UK’s biggest health problem. The heart acts as a pump pushing blood round the body, which supplies oxygen and nutrients to all cells and removes waste products. The average adult has about eight pints of blood which the heart continuously circulates by beating around 100,000 times a day. The heart and the blood vessels (arteries, veins and capillaries) make up our circulatory system called the cardiovascular system. CVD (such as heart disease and stroke) occurs when there is a build up of fatty deposits (plaques) on the inside walls of the arteries. These plaques can clog up the arteries making them narrower and restricting the blood flow in the same way that sewerage pipes get blocked when people pour animal fat down the plughole! Reduced blood flow to the heart can then lead to chest pain and discomfort (angina). A blood clot in the coronary artery may cut off the blood supply to the heart, which can then result in a heart attack and sudden death. Fatty deposits (plaques) build up in the lining of the arteries over time. As the artery narrows, the risk increases that a clot will form and completely block the blood flow. If this happens in the brain, an ischaemic stroke can be the result. If a small artery is blocked, the symptoms may be minor, but if a major artery is blocked the symptoms can be severe, often fatal. A transient ischaemic attack (TIA) is also known as a mini-stroke as the blood supply to the brain is only cut off for a short time. aemorrhagic strokes are caused by a weakened artery bursting, and then allowing blood to seep out of the artery wall and damage the brain tissue by pressing on it, other brain cells may also be damaged because they’re not receiving enough oxygen. Ischaemic strokes are the most common type in the UK, causing 17 out of every 20 cases of stroke (NHS Direct, 2007). CVD is a major cause of death and ill health in the UK. Heart disease is the UK’s biggest single killer, with one in every four men and one in every six women dying from the disease. In the UK, approximately 300,000 people have a heart attack each year (NHS Direct, 2007a), and someone has a stroke every five minutes. They are more common among those over the age of 65, but can happen at any age. Strokes are the leading cause of disability in the UK, and the third most common cause of death after cancer and heart disease (NHS Direct, 2007). The financial cost of this health crisis is phenomenal; in 2004, the cost of prescriptions for cholesterol-lowering drugs (including statins) was £769 million (BHF, 2005). It is widely accepted that certain factors such as smoking or being overweight can increase the risk of CVD. These features are referred to as risk factors. Early work dating back to the 1940s helped establish the concept of risk factors. In 1946, Los Angeles physician, Dr Lester Morrison, began a study that would later reveal the crucial role of diet in heart disease (Morrison, 1960). Morrison reduced the fat intake of 50 heart attack survivors and compared their health to 50 other heart attack survivors whose fat intake was left unchanged (the control group). After eight years, 38 of the control group had died compared to just 22 of the low-fat group. After 12 years, the entire control group had died but 19 of the low-fat diet group were still alive. Around the same time, the residents of Framingham, just outside Boston Massachusetts in the US, took part in a study to investigate the role of diet and lifestyle in heart disease. By observing who suffered from heart disease and who did not, the Framingham Study helped identify several key risk factors (Kannel et al., 1961). A number of these are now firmly associated with heart disease including high cholesterol levels, hypertension, family history of heart disease, diabetes, obesity, smoking and poor diet. The World Health Organisation (WHO) states that the rise in CVD reflects a significant change in dietary habits, physical activity levels and tobacco consumption worldwide as a result of industrialisation, urbanisation, economic development and food market globalisation. They suggest that people are consuming more calorific, nutrient-poor (junk) foods and are less physically active (WHO, 2007). There is much evidence linking CVD to unhealthy diets including the high consumption of saturated fats, salt, refined carbohydrates (such as sugar, white bread and white flour) and the low consumption of fruits and vegetables (WHO/FAO, 2002). Cholesterol is a fatty substance most of which, contrary to popular belief, is produced by the liver. Only a small amount (15-20 per cent) comes from the diet – and only then if it contains animal foods (however eating ‘bad’ fats and animal protein raises cholesterol levels more than eating cholesterol itself – see below). Even high-fat plant foods such as avocados, nuts and seeds contain no cholesterol whatsoever, so a vegan diet is cholesterol-free. It is also animal fat and animal protein-free. We do not need cholesterol in our diets, the liver can manufacture as much as we need for making cell membranes and various hormones, for example. However, there is no mechanism limiting the amount produced and too much can lead to CVD. Cholesterol is carried in the bloodstream by lipoproteins. LDL (low-density lipoprotein) takes cholesterol from the liver to the cells and is often referred to as ‘bad’ cholesterol because when LDL levels are high, it can accumulate on the walls of the arteries. HDL (high-density lipoprotein) carries excess cholesterol back to the liver for excretion and is called ‘good’ cholesterol. Evidence suggests that LDL can also harm the walls of the arteries when it is damaged, or oxidised (Galassetti and Pontello, 2006). However, research shows that LDL in vegetarians is less susceptible to oxidative damage (Lu et al., 2000). This may be due to the low-fat, high-antioxidant (vitamins A, C and E) and/or soya food content of a well-balanced plant-based diet. This could be why the Mediterranean diet – also low-fat and rich in fruit and vegetables – is associated with a lower incidence of CVD (Lapointe et al., 2006). Current UK guidelines state that we should aim for a cholesterol level below 5.0mmol/l. The average level for men in the UK is about 5.5 mmol/l and about 5.6 mmol/l for women. Saturated, hydrogenated (and trans) fats and animal protein are the main culprits in the diet that raise cholesterol levels. It used to be thought that dietary cholesterol itself was the main villain however this is not the case, although those at risk of heart disease should limit their intake or avoid it completely. The traditional approach to lowering cholesterol levels was to reduce total fat (and cholesterol) intake. However, research shows that replacing saturated fat with unsaturated fat is more effective (Hu et al., 2001). A well-balanced plant-based diet contains less saturated fat and more unsaturated fat than the typical Western diet dominated by meat, poultry, eggs and dairy. However, a vegetarian diet rich in dairy foods is not the answer as high-fat dairy products are a major source of saturated fat and cholesterol. In 1985, research published in the Journal of the American Medical Association suggested that ingestion of high-fat dairy products raises both total and LDL ‘bad’ cholesterol levels (Sacks et al., 1985). Cheddar cheese contains around 35 per cent fat of which over 60 per cent is saturated. Similarly, butter contains over 80 per cent fat of which over 60 per cent is saturated (FSA, 2002). To reduce the intake of saturated fat, the UK government recommends avoiding or cutting down on egg yolks, red meat, butter, whole milk, cheese, cakes and chips (NHS Direct, 2007). Hydrogenated and Trans Fats can also raise Cholesterol Levels. Some evidence suggests that the effects of trans fats may be worse than saturated fats. Trans fats are found in processed foods such as biscuits, cakes, fast food, pastry and margarines. They are also found naturally at low levels in dairy products, beef and lamb (FSA, 2007). The message is clear – replace fatty animal foods with healthier vegan options. These dietary risk factors do not just apply to adults; there is a significant body of evidence showing that the early consumption of cow’s milk and dairy products can contribute to a higher risk of CVD later in life. A review on infant feeding practices published in the US journal Pediatrics suggested that the consumption of whole milk should be discouraged in infants because of its potential role in heart disease (Oski, 1985). More recently the WHO stated that the current evidence indicates adverse effects of formula milk on CVD risk factors; this, they say, is consistent with the observations of increased mortality among older adults who were fed formula as infants (WHO/FAO, 2002). The WHO states that as a global public health recommendation, infants should be exclusively breast fed for the first six months of life to achieve optimal growth, development and health (WHO, 2001). Blood pressure measures how strongly blood presses against the walls of your arteries as it flows through them. It is normal for blood pressure to increase during vigorous physical activity or when you feel stressed but if your blood pressure is consistently higher than normal it is called high blood pressure or hypertension. Blood pressure is measured in terms of millimetres of mercury (mmHg). When you have your blood pressure measured two readings are taken. The first and higher measurement is the systolic pressure; a measure of the blood pressure as your heart contracts and pumps blood out. The second, lower number is the diastolic pressure; a measure of the blood pressure when the heart is relaxed and filling up with blood. Hypertension is defined as a systolic pressure of 140 mmHg or more, or a diastolic pressure of 90 mmHg or more. High blood pressure can increase the risk of clotting in the arteries and is often referred to as the ‘silent killer’ as there may be no symptoms. Moderately high blood pressure is found in about one in four middle-aged people in the UK and very high blood pressure in about one in 25. You can have your blood pressure measured by your doctor; the test is simple, quick and painless. Certain factors increase the risk of high blood pressure including smoking, family history, obesity, excessive alcohol intake, lack of exercise and poor diet. A high-salt intake can increase the amount of water retained in the body and so drive up blood pressure. The UK Food Standards Agency recommends that adults should eat no more than six grams of salt per day. Approximately 20-40 per cent of blood pressure variability is accounted for by genetics (Ward, 1980). The remaining 60-80 per cent is determined by lifestyle factors, particularly diet. An extensive review of the evidence published in the journal Nutrition Reviews explains how a vegetarian diet high in fruits, vegetables, legumes and nuts lowers the blood pressure by a variety of different mechanisms (Berkow and Barnard, 2005). The authors of this review explain how vegetarians tend to weigh less (see below) and how lower body weight is strongly associated with lower blood pressure. They explain how vegetarians tend to consume less saturated fat and more polyunsaturated fat and suggest this may help modulate blood viscosity (thickness or resistance to flow). They also suggest that certain nutrients (potassium, magnesium and other minerals, antioxidants and fibre) present in abundance in a vegetarian diet, may lower blood pressure. Numerous studies confirm that vegetarian and vegan diets are beneficial for both the prevention and treatment of hypertension (Appleby et al., 2002; American Dietetic Association, 2003; Leitzmann, 2005). The widespread adoption of a plant-based diet would be a major step in reducing the incidence of this potentially dangerous condition (see the mini-guide Know Your Numbers: Blood Pressure). Being overweight or obese increases the risk of CVD via a range of mechanisms. It can place a strain on the heart, lungs, kidneys and other organs. As weight increases so does blood pressure and insulin resistance. Overweight and obese people tend to higher levels of LDL ‘bad’ cholesterol and lower levels of HDL ‘good’ cholesterol. On the other hand, numerous studies show that vegetarians weigh less (Appleby et al., 1998; Key et al., 1999; Newby et al., 2005; Barnard et al., 2005). In 2003, a large-scale study revealed that vegans have healthier, lower body mass index (BMI) than vegetarians, fish-eaters and meat-eaters respectively (Spencer et al., 2003). A subsequent review of 40 studies revealed that, on average, vegetarians and vegans weigh between six pounds and two stones less than meat-eaters (Berkow and Bernard, 2006). This study concluded that a vegetarian diet can be used successfully for weight loss (see the guide The V-Plan Diet). There are of course other factors that contribute to the risk of CVD. Exercise is important as it increases ‘good’ HDL cholesterol levels, which in turn helps keep ‘bad’ LDL cholesterol levels down. Exercise also helps control weight. Smoking is a major risk factor as it hardens the arteries, causing them to narrow. Excessive alcohol consumption can increase the risk of CVD by increasing blood pressure, heart rate and cholesterol as well as contributing to weight gain. Vegetarians have lower cholesterol levels (by about 0.5mmol/l), lower blood pressure, weigh less (on average between six pounds and two stone less) and have a lower risk of dying from heart disease by a massive 25 per cent! A well-balanced low-fat high-fibre plant-based diet reduces the risk of obesity, high cholesterol, hypertension and can be used to prevent, treat and even reverse heart disease. Dr Dean Ornish, Clinical Professor of Medicine at the University of California in San Francisco, is best known for his Lifestyle Heart Trial in which he treated severe heart disease patients with lifestyle changes alone. The experimental group ate a low-fat wholegrain plant-based diet containing lots of fruits, vegetables and pulses. They also followed an exercise programme, practised various forms of stress management and did not receive medication. They were monitored against a ‘control’ group of similar patients who received conventional treatments. After just one year, 82 per cent of patients on this lifestyle change regime had regression of their heart disease with a 91 per cent reduction in chest pain and reduced cholesterol levels; whereas the control group experienced a 165 per cent increase in the frequency of chest pain; cholesterol was worse and blockages of arteries became worse (Ornish et al., 1990; Ornish et al., 1998). This trial has continued with similar results and continues to achieve better results than conventional surgical or medical intervention. More recent work shows that vegetarians generally have a much lower risk of heart disease than meat-eaters. One major study shows that vegetarians have a massive 25 per cent lower risk of dying from heart disease! The authors of this study conclude that the widespread adoption of a vegetarian diet could prevent approximately 40,000 deaths from heart disease in Britain each year (Key et al., 1999). The role of animal-based foods in stroke has raised some controversy with a number of scientists suggesting that animal foods may contain some component that has a protective effect against stroke (Ding and Mozaffarian, 2006). We know that animal products increase the build up of fatty deposits in the coronary arteries so how could they protect arteries in the brain? The theory is yet to be proven but suggests that certain fatty acids (arachadonic acid), mainly obtained from animal sources, may help maintain the integrity of the smaller blood vessel walls in the brain and protect against stroke. However, the research suggests that the protective effect of animal products may be largely confined to haemorrhagic stroke (Sauvaget et al., 2003), whereas the majority of strokes in the UK are ischaemic (caused by blockages). Furthermore, the supposed protective role may be restricted to those with low cholesterol and high blood pressure. It would be better to change to a healthier diet to lower the blood pressure than to attempt to avoid a stroke by eating more of the types of food that lead to high blood pressure, obesity and heart disease! Numerous studies do confirm that increasing the amount of fruit and vegetables in the diet can reduce the risk of stroke (Gillman et al., 1995; Johnsen et al., 2003, Pomerleau et al., 2006). One review quantified the effect by examining a group of studies involving a total of 114,279 adults of whom 570 experienced a stroke (Joshipura et al., 1999). Results showed that those consuming the most fruit and vegetables (around 10 servings per day) had a 31 per cent lower risk of stroke. A more recent review of eight studies (including 257,551 people and 4,917 stroke events) concurred fruit and vegetables had a significant protective effect (He et al., 2006). The authors said these results provide strong support for the recommendations to consume more than five servings of fruit and vegetables per day, which is likely to cause a major reduction in strokes. Examining the incidence of CVD in other cultures allows us to draw conclusions about the role of diet in disease. Several studies show that death rates from CVD are linked country-by-country with the consumption of cow’s milk and dairy products (Moss and Freed, 2003). In his book The China Study, Professor T. Colin Campbell (Professor of Nutritional Biochemistry at Cornell University, Ithaca, NY), observes the low rates of heart disease in the southwest Chinese provinces of Sichuan and Guizhou; between 1973 and 1975 not one single person died of heart disease before the age of 64 among 246,000 men and 181,000 women (Campbell and Campbell, 2005). Campbell suggests these figures reflect the important protective role of low blood cholesterol levels observed in rural China. Vegetarians consume a third less saturated fat and only half as much cholesterol as meat-eaters. Vegans consume even less – half the amount of saturated fat eaten by meat-eaters and no cholesterol (Davis et al., 2003). A large-scale study investigating cholesterol levels among vegans, vegetarians, fish- and meat-eaters found that the vegans had the lowest levels, vegetarians and fish-eaters had intermediate or similar values and the meat-eaters had the highest (Appleby et al., 1999). This study showed that as consumption of meat and cheese rises, so do cholesterol levels but as fibre intake increases, cholesterol levels fall. Fibre reduces blood cholesterol levels either by interfering with cholesterol absorption or production (Queenan et al., 2007). More good news for vegetarians who tend to eat more fibre than meat-eaters. A healthy vegetarian diet, characterised by a higher intake of fruits and vegetables, wholegrains, pulses and nuts results in higher intakes of antioxidants as well as fibre compared with non-vegetarian diets (Rajaram, 2003). A large body of experimental and epidemiological data indicates that antioxidant vitamins may be able to reduce atherosclerosis – the progressive thickening and hardening of arterial walls that results from the build up of fatty deposits (Azen et al., 1996). In other words a high intake of fruit and vegetables can help strengthen the arteries and inhibit the build up of plaques. Vegans have healthier levels of total cholesterol, LDL and HDL in their blood compared to vegetarians, which in turn have better levels than meat-eaters. A study published in the Journal of the American College of Nutrition investigating the risk factors associated with CVD found that African-American vegans exhibit a more favourable serum lipid profile (a healthier balance of fats in the blood) compared to vegetarians who ate milk, milk products and eggs (Toohey et al., 1998). The major factors contributing to this result were thought to be the lower saturated fat intake and higher fibre intake of vegans. The message could not be more simple: animal-based foods (meat, poultry, eggs and dairy) lead to high cholesterol levels, high blood pressure, obesity and other risk factors linked to CVD. A well-balanced vegan diet containing plenty of fruit and vegetables, wholegrains, pulses, nuts and seeds lowers the risk of CVD. As stated above, this applies to people wishing to avoid CVD and people who already have CVD. As the research shows, you can reverse heart disease by making lifestyle and dietary changes alone. It’s never too late! The scientific evidence is compelling – the best way to protect your heart is to go veggie, or better still, vegan! Ditch saturated animal fats. Swap meat, eggs and dairy foods for healthier plant-based options including fruit and vegetables, wholegrains (wholemeal bread, wholemeal pasta, brown rice, oats), pulses (peas, beans and lentils), nuts and seeds. Switch to healthy plant-based fats. Omega-3 essential fatty acids protect your heart. Flax seed (linseed) oil is an excellent source. Keep it in the fridge and add to dressings, sauces and cooked food only as heating destroys its beneficial properties. Other sources include walnuts, soya beans, rapeseed and hemp seed oils and green leafy vegetables. In oily fish, pollutants such as mercury, polychlorinated biphenyls (PCBs) and dioxins may outweigh any potential benefits (see the fact sheet Fishing for Facts). Fabulous fibre. Fibre from fruits, vegetables, pulses and wholegrains lowers blood pressure and cholesterol. 10 grams of fibre a day reduces the risk of heart attack by 14 per cent and the risk of dying from heart disease by 27 per cent. A medium-sized apple contains around 3.0 grams of fibre, a slice of wholemeal bread contains 1.5 grams and a small portion of broccoli about 2.7 grams. Rice bran is an excellent source of fibre and has been shown to lower cholesterol. Buy it from health food shops and sprinkle it on breakfast cereals and use in stews and soups. Get your 5-a-day. Eat at least five portions of fruit and veg a day. Not just for the fibre but for the disease-busting antioxidants vitamins A, C and E. These can boost heart health as well as protecting against cancer and other diseases. Choose brightly-coloured varieties to optimise your antioxidant intake: sweet potato, purple sprouting broccoli, red cabbage, asparagus, curly kale, blueberries, raspberries and avocados. Include soya foods. 25 grams of soya protein per day can lower cholesterol levels. A 250ml glass of Alpro soya milk (blue carton) contains 9.3 grams of protein and 100 grams of Cauldron Organic Tofu contains 12 grams. Take regular exercise. Lack of physical activity raises the risk of heart disease. A well-balanced vegetarian or vegan diet, coupled with regular exercise, can help shed those excess pounds! Set yourself a daily target of 10,000 steps and walk your way to health and fitness with a pedometer. Cut out the salt. A high salt intake can increase blood pressure. The government recommends no more than 6.0 grams per day for adults. Use fresh herbs and spices to flavour your food and get rid of the salt-cellar – your taste buds will adapt very quickly. Watch out homocysteine’s about. This amino acid (a building block of protein) is produced in the body and can cause serious problems if it accumulates to high levels. You can reduce homocysteine levels by ensuring an adequate intake of folate (folic acid) and vitamins B6 and B12. Folate and B6 are available in yeast extract, green leafy vegetables, pulses (peas, beans, lentils), wholegrains (wholemeal bread, wholemeal pasta, brown rice, oats), nuts and fortified breakfast cereals. B12 is found in fortified foods including yeast extracts, soya milks, breakfast cereals and margarines. Chill out. Take time out just for yourself with a gentle activity such as yoga or Tai Chi, or just take a moment to relax. Don’t smoke. Smoking is a major risk factor and stopping can halve your risk of CVD after just one year. Cut back the booze. Too much alcohol increases the risk of CVD. Avoid binge drinking. American Dietetic Association; Dietitians of Canada. 2003. Position of the American Dietetic Association and Dietitians of Canada: Vegetarian diets. Journal of the American Dietetic Association. 103 (6) 748-765. Appleby, P.N., Thorogood, M., Mann, J.I. and Key, T.J. 1998. Low body mass index in non-meat eaters: the possible roles of animal fat, dietary fibre and alcohol. International Journal of Obesity and Related Metabolic Disorders. 22 (5) 454-460. Appleby, P.N., Thorogood, M., Mann, J.I. and Key, T.J. 1999. The Oxford Vegetarian Study: an overview. American Journal of Clinical Nutrition. 70 (3 Suppl) 525S-531S. Appleby, P.N., Davey, G.K. and Key, T.J. 2002. Hypertension and blood pressure among meat eaters, fish eaters, vegetarians and vegans in EPIC-Oxford. Public Health Nutrition. 5 (5) 645-654. Azen, S.P., Qian, D., Mack, W.J., Sevanian, A., Selzer, R.H., Liu, C.R., Liu, C.H. and Hodis, H.N. 1996. Effect of supplementary antioxidant vitamin intake on carotid arterial wall intima-media thickness in a controlled clinical trial of cholesterol lowering. Circulation. 94 (10) 2369-2372. Barnard, N.D., Scialli, A.R., Turner-McGrievy, G., Lanou, A.J. and Glass, J. 2005. The effects of a low-fat, plant-based dietary intervention on body weight, metabolism, and insulin sensitivity. American Journal of Medicine. 118 (9) 991-997. Berkow, S.E,and Barnard ND. 2005. Blood pressure regulation and vegetarian diets. Nutrition Reviews. 63 (1) 1-8. Berkow, S.E. and Barnard, N. 2006. Vegetarian diets and weight status. Nutrition Reviews. 64 (4) 175-88. BHF, 2005. BHF Coronary Heart Disease Statistics 2005.p61 [online]. Available from: www.heartstats.org/temp/CHD_2005_Whole_ spdocument.pdf [Accessed February 13 2007]. Campbell, T.C. and Campbell, T.M. II. 2004. The China Study. Dallas, Texas, USA: BenBella Books. Davis, B.C. and Kris-Etherton, P.M. 2003. Achieving optimal essential fatty acid status in vegetarians: current knowledge and practical implications. American Journal of Clinical Nutrition. 78 (3 Suppl) 640S-646S. Ding, E.L. and Mozaffarian, D. 2006. Optimal dietary habits for the prevention of stroke.Seminars in Neurology. 26 (1) 11-23. FSA, 2007. Eat well, be well website. Fats. [online] Available at: www.eatwell.gov.uk/healthydiet/nutritionessentials/fatssugarssalt/fats [Accessed May 1 2007]. Galassetti P, Pontello A. 2006. Dietary effects on oxidation of low-density lipoprotein and atherogenesis. Current Atherosclerosis Reports. 8 (6) 523-529. Gillman, M.W., Cupples, L.A., Gagnon, D., Posner, B.M., Ellison, R.C., Castelli, W.P. and Wolf, P.A. 1995. Protective effect of fruits and vegetables on development of stroke in men. Journal of the American Medical Association. 273 (14) 1113-7. He, F.J., Nowson, C.A. and MacGregor, G.A. 2006. Fruit and vegetable consumption and stroke: meta-analysis of cohort studies. Lancet. 367 (9507) 320-6. Hu, F.B., Manson, J.E. and Willett, W.C. 2001. Types of dietary fat and risk of coronary heart disease: a critical review. Journal of the American College of Nutrition. 20 (1) 5-19. JHCI, 2002. Joint Health Claims Initiative. [online] Available from: http://www.jhci.org.uk/approv/schol2.htm [Accessed February 22 2007). Johnsen, S.P., Overvad, K., Stripp, C., Tjønneland, A., Husted, S.E. and Sørensen H.T. 2003. Intake of fruit and vegetables and the risk of ischemic stroke in a cohort of Danish men and women.American Journal of Clinical Nutrition. 78 (1) 57-64. Joshipura, K.J., Ascherio, A., Manson, J.E., Stampfer, M.J., Rimm, E.B., Speizer, F.E., Hennekens, C.H., Spiegelman, D. and Willett, W.C. 1999. Fruit and vegetable intake in relation to risk of ischemic stroke. Journal of the American Medical Association. 282 (13) 1233-9. Kannel, W.B., Dawber, T.R., Kagan, A., Revotskiw, N., Stokes, J. 3rd. 1961. Factors of risk in the development of coronary heart disease--six year follow-up experience. The Framingham Study. Annals of Internal Medicine. 55, 33-50. Key, T.J., Davey, G.K. and Appleby, P.N. 1999. Health benefits of a vegetarian diet.Proceedings of the Nutrition Society. 58 (2) 271-275. Lapointe, A., Couillard, C. and Lemieux, S. 2006. Effects of dietary factors on oxidation of low-density lipoprotein particles. Journal of Nutritional Biochemistry. 17 (10) 645-658. Leitzmann C. 2005. Vegetarian diets: what are the advantages? Forum of Nutrition. (57) 147-156. Lu, S.C., Wu, W.H., Lee, C.A., Chou, H.F., Lee, H.R. and Huang, P.C. 2000. LDL of Taiwanese vegetarians are less oxidizable than those of omnivores. Journal of Nutrition. 130 (6) 1591-1596. Morrison, L.M. 1960. Diet in coronary atherosclerosis. Journal of the American Medical Association. 25, 173, 884-8. Moss, M. and Freed, D. 2003. The cow and the coronary: epidemiology, biochemistry and immunology. International Journal of Cardiology. 87 (2-3) 203-16. Newby, P.K., Tucker, K.L. and Wolk, A. 2005. Risk of overweight and obesity among semivegetarian, lactovegetarian, and vegan women. American Journal of Clinical Nutrition. 81 (6) 1267-1274. NHS Direct, 2007. Direct Online Health Encyclopaedia. Stroke. [online] Available at: http://www.nhsdirect.nhs.uk/articles/article.aspx?articleId=351 [Accessed July 4 2007]. NHS Direct, 2007a. NHS Direct Online Health Encyclopaedia. Coronary Heart Disease. [online] Available at: http://www.nhsdirect.nhs.uk/articles/ article.aspx?articleId=444 [Accessed July 4 2007]. Oski F.A., 1985. Is bovine milk a health hazard? Pediatrics. 75 (1 Pt 2) 182-6. Ornish, D., Brown, S.E., Scherwitz, L.W., Billings, J.H., Armstrong,W.T., Ports, T.A., McLanahan, S.M., Kirkeeide, R.L., Brand, R.J. and Gould, K.L. 1990. Can lifestyle changes reverse coronary heart disease? The Lifestyle Heart Trial. Lancet. 336 (8708) 129-133. Ornish, D., Scherwitz, L.W., Billings, J.H., Brown, S.E., Gould, K.L., Merritt, T.A., Sparler, S., Armstrong, W.T., Ports, T.A., Kirkeeide, R.L., Hogeboom, C. and Brand, R.J. 1998. Intensive lifestyle changes for reversal of coronary heart disease. Journal of the American Medical Association. 280 (23) 2001-2007. Pomerleau, J., Lock, K. and McKee M. 2006. The burden of cardiovascular disease and cancer attributable to low fruit and vegetable intake in the European Union: differences between old and new Member States. Public Health Nutrition. 9 (5) 575-83. Potter, S.M. 1995. Overview of proposed mechanisms for the hypocholesterolemic effect of soy.Journal of Nutrition. 125 (3 Suppl) 606S-611S. Queenan, K.M., Stewart, M.L., Smith, K.N., Thomas, W., Fulcher, R.G. and Slavin, J.L. 2007. Concentrated oat beta-glucan, a fermentable fiber, lowers serum cholesterol in hypercholesterolemic adults in a randomized controlled trial. Nutrition Journal. 6, 6. Rajaram S. 2003. The effect of vegetarian diet, plant foods, and phytochemicals on hemostasis and thrombosis. American Journal of Clinical Nutrition. 78 (3 Suppl) 552S-558S. Sacks, F.M., Ornish, D., Rosner, B., McLanahan, S., Castelli, W.P. and Kass, E.H. 1985. Plasma lipoprotein levels in vegetarians. The effect of ingestion of fats from dairy products. Journal of the American Medical Association. 254 (10) 1337-1341. Sauvaget, C., Nagano, J., Allen, N., Grant, E. and Beral, V. 2003. Intake of animal products and stroke mortality in the Hiroshima/Nagasaki Life Span Study. International Journal of Epidemiology. 32, 536–43. Sirtori, C.R., Agradi, E., Conti, F., Mantero, O. and Gatti, E. 1977. Soybean-protein diet in the treatment of type-II hyperlipoproteinaemia. Lancet. 1 (8006) 275-7. Spencer, E.A., Appleby, P.N., Davey, G.K. and Key, T.J. 2003. Diet and body mass index in 38000 EPIC-Oxford meat-eaters, fish-eaters, vegetarians and vegans. International Journal of Obesity and Related Metabolic Disorders. 27 (6) 728-734. Toohey, M.L., Harris, M.A., DeWitt, W., Foster, G., Schmidt, W.D. and Melby, C.L. 1998. Cardiovascular disease risk factors are lower in African-American vegans compared to lacto-ovo-vegetarians. Journal of the American College of Nutrition. 17 (5) 425-34. Tucker, K.L., Olson, B., Bakun, P., Dallal, G.E., Selhub, J. and Rosenberg, I.H. 2004. Breakfast cereal fortified with folic acid, vitamin B-6, and vitamin B-12 increases vitamin concentrations and reduces homocysteine concentrations: a randomized trial. American Journal of Clinical Nutrition. 79 (5) 805-811. Wang, X., Qin, X., Demirtas, H., Li, J., Mao, G., Huo, Y., Sun, N., Liu, L. and Xu, X. 2007. Efficacy of folic acid supplementation in stroke prevention: a meta-analysis. Lancet. 369 (9576) 1876-82. Ward R. 1980. Familial aggregation and genetic epidemiology of blood pressure. In: Laragh JH and Brenner BM, editors, Hypertension, Pathophysiology, Diagnosis and Management. New York, NY: Raven Press, 81-100.
WHO, 2001. The optimal duration of exclusive breastfeeding. A systematic review. Geneva, Switzerland. World Health Organization. (Document WHO/NHD/01.08). WHO/FAO, 2002. Diet, nutrition and the prevention of chronic diseases: report of a joint WHO/FAO expert consultation p81 [online]. Available from: www.who.int/hpr/NPH/docs/who_fao_expert_report.pdf [Accessed February 22 2007]. WHO, 2007. Cardiovascular disease: prevention and control [online]. Available from: http://www.who.int/dietphysicalactivity/ publications/facts/cvd/en/ [Accessed July 10 2007].